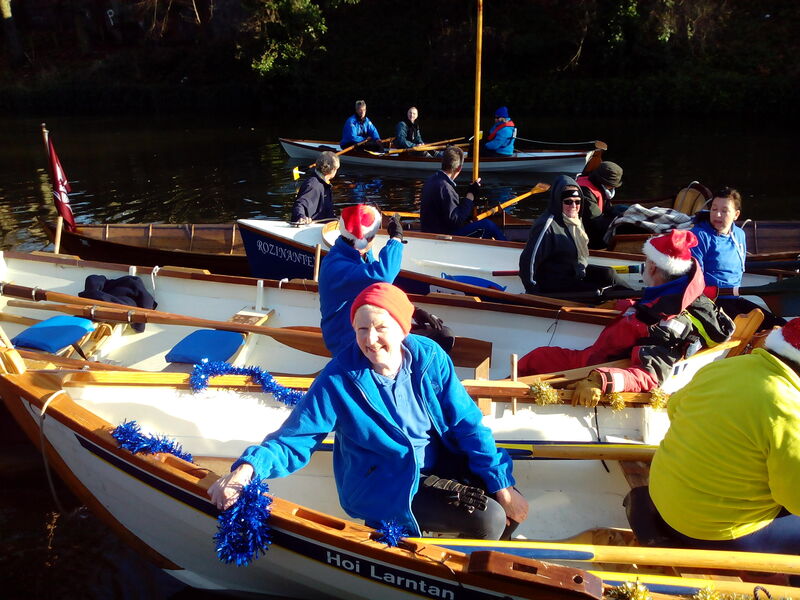 We wish the best of good cheer to all and fair weather to those hardy souls rowing over the next couple of weeks. Thanks again to everyone who has taken part and/or helped in any way. Has it all been worth it…? Our expert analyst, Adrian, has been through the bookings’ calendar and judging by what he has found it most certainly has been very well worth it. Between 1st June 2013 and 6th December 2014 there have been outings recorded on 174 days, 122 in 2014. 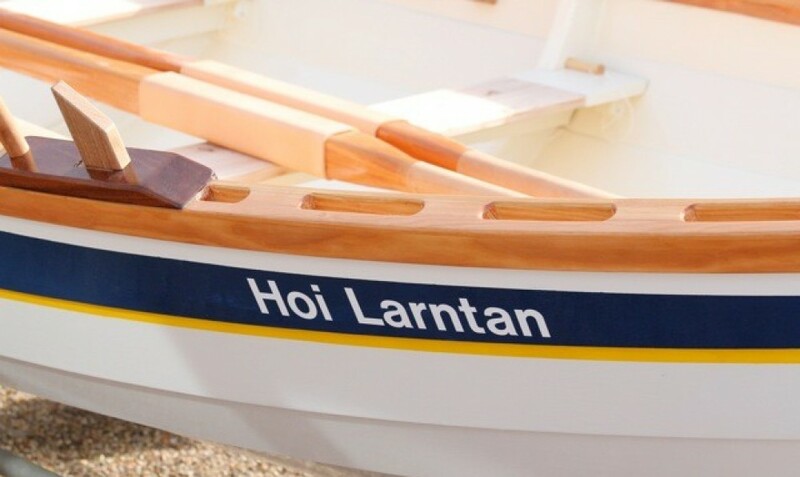 118 different individuals have rowed in either Hoi Larntan or Bluejacket. The total number of individual outings is 996, of which 720 have occurred in 2014. One member has recorded 64 outings in total, of which 49 have been in 2014. Another member has recorded 50 outings in 2014 alone. 5 members have recorded more than 40 outings in 2014. 2 members have recorded between 30 and 40 outings in 2014. 6 members have recorded between 20 and 29 outings in 2014. 9 members have recorded between 10 and 19 outings in 2014. 64 new people have experienced outings in 2014. Including youngsters from The Holt Youth Project and Gresham’s School. It is clear that both boats have more than justified their existence. Worth remembering that without help from the Big Society Fund we wouldn’t have had Bluejacket. So a big thank you again to North Norfolk District Council. 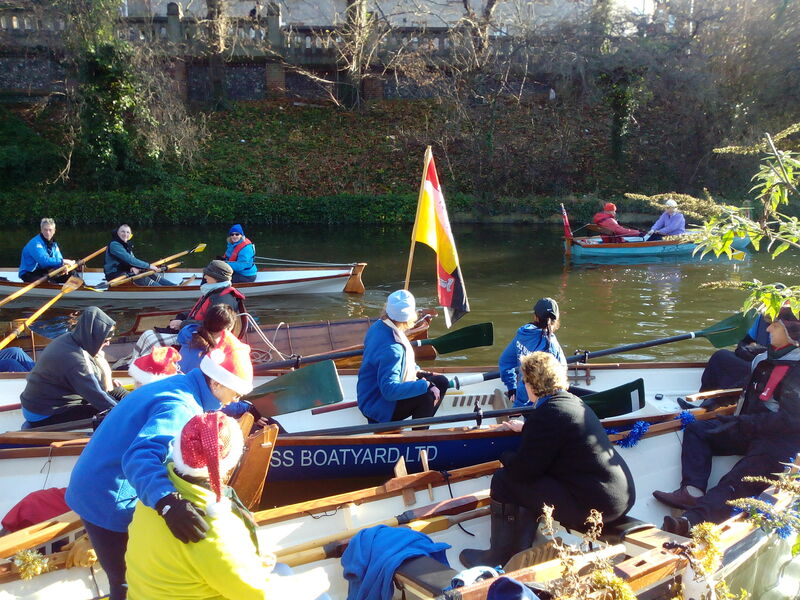 A sunny, chilly 6 December on the River Wensum in Norwich – it must be the Carrow Cup. 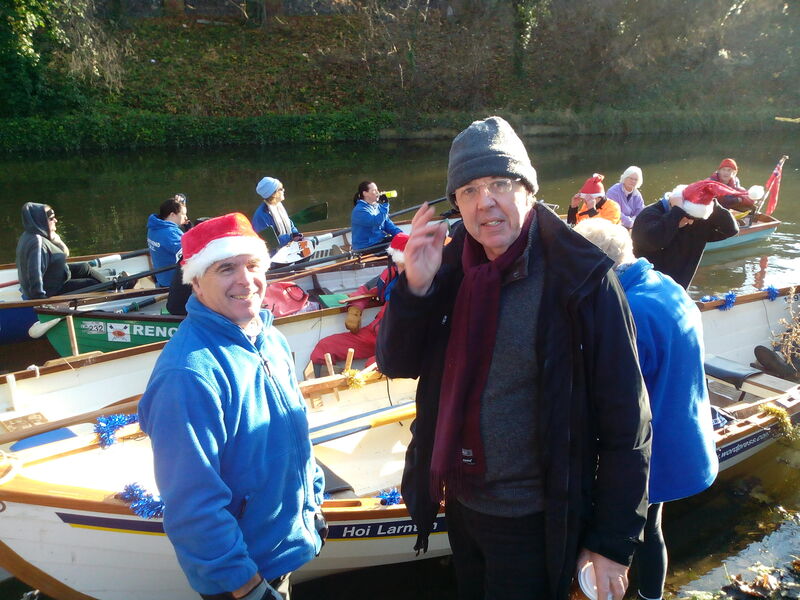 First raced 200 years ago – no St Ayles skiffs back then. 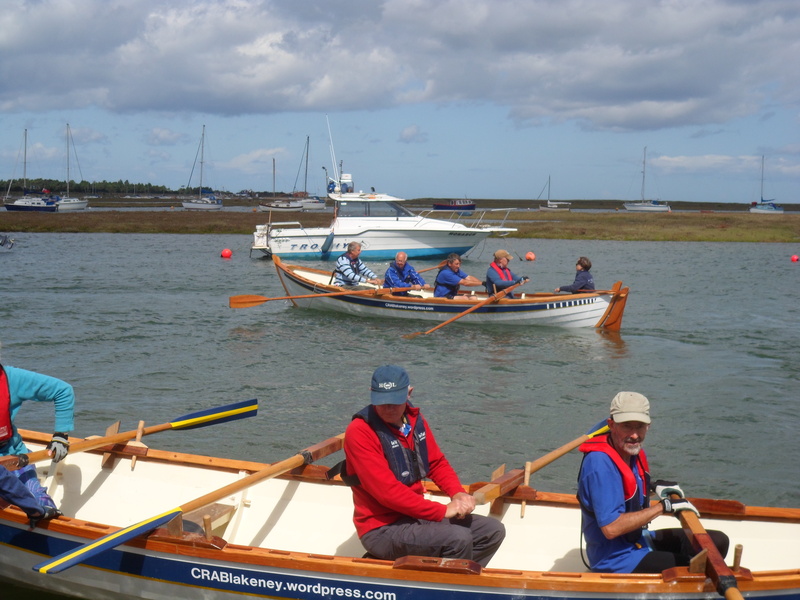 Nowadays four different divisions (mainly carbon fibre and sliding seat) and handicapping for the traditional boats. 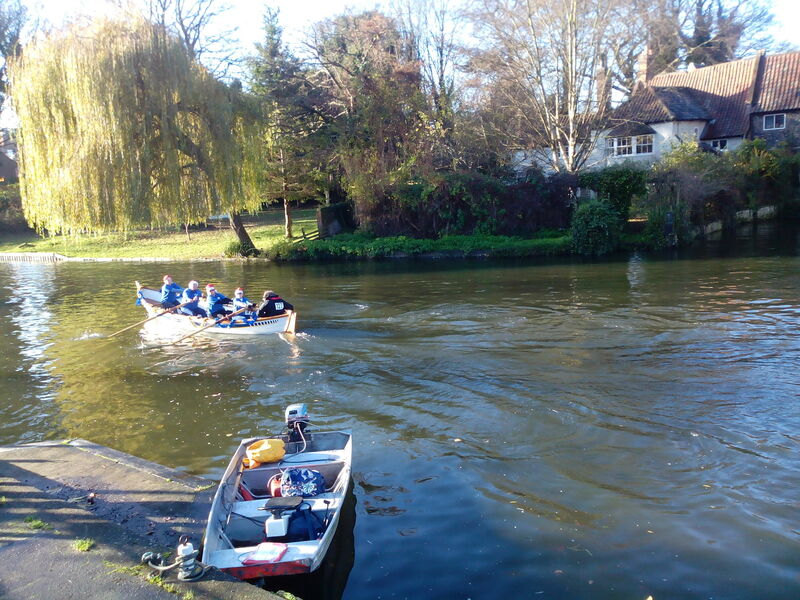 Our ladies crew in Hoi Larntan, delicately urged on by cox Andy Marczewski and the mens’ crew in Bluejacket, elegantly kept in order by Robin Combe battled their way downstream. 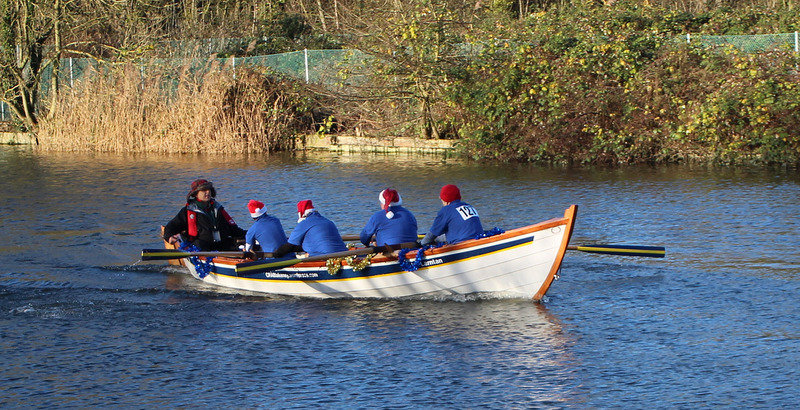 As the ladies haven’t ceased telling us (and anyone else within earshot!) they beat the men! So effective is their training method! I’ll raise a glass to that. Well done ladies. Full results and more photos to follow. Last of the Summer wine…? 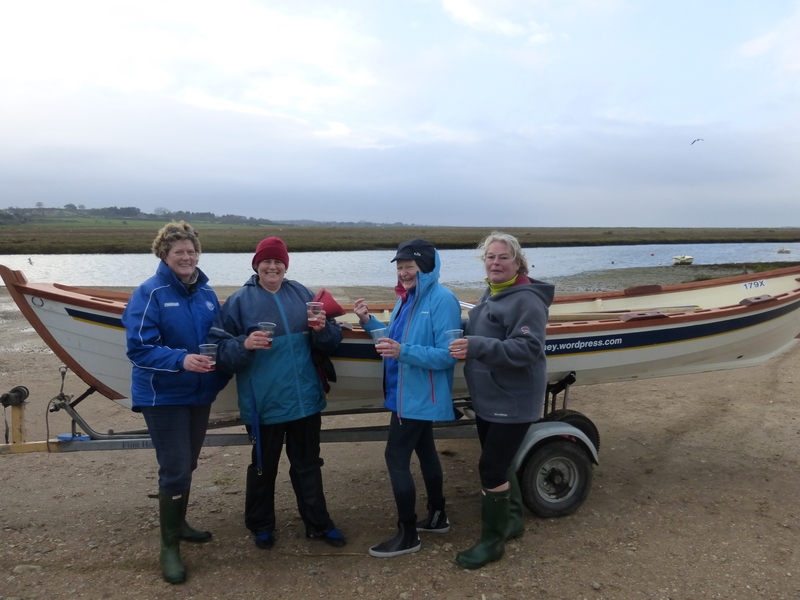 Knowing the ladies concerned it may not be the last of the pink bubbly but it certainly was the last row on the sea at Blakeney this year. 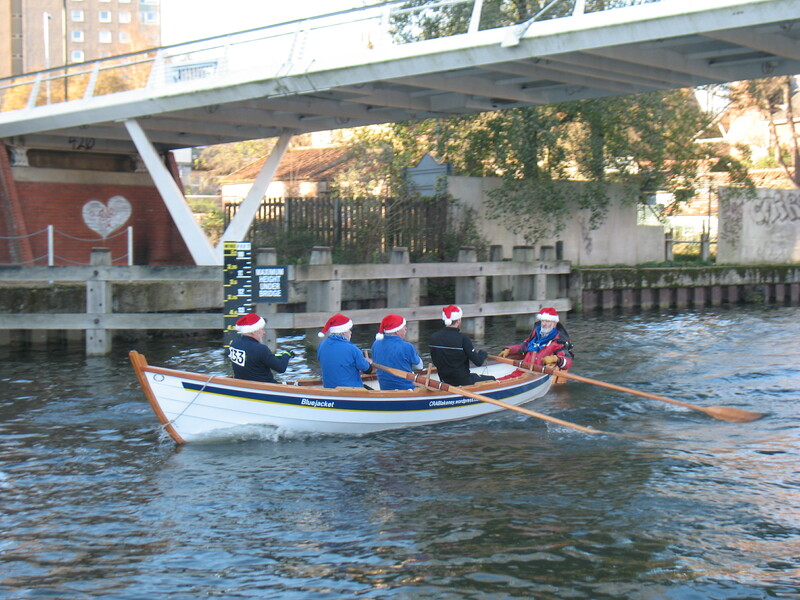 After this outing Hoi Larntan was packed up and off to Norwich to row on the river through the city, competing in the Carrow Cup. Then she will come back for a well earned re-furb. The ladies tell me the picture above shows their definition of training. We wait to see if the results prove how well it works.